One becomes tired of, and bored, with the Sydney Daily Cartoon book misogynisitc attacks on Mayor Clover Moore's policies to improve the amenity of city streets - by reducing car traffic. Virtually any city in Australia is more pleasant than Sydney, due to the invasion of cars. Australians buy 1 million new cars a year, and I swear 990,000 are in the Sydney CBD. So what is really going on? Bad News Corp are leveraging the advertising market on car sales. Chances are these attacks on Clover Moore are nothing more than that. Sleazy advertising editorial at play. Ditto the values challenged Parrot. We think anyone who wants a better Sydney, clean air to breathe, more successful strip shopping centres, and happier communities sharing public space, should direct their car related business away from the bad News Corp carsguide.com.au until the cartoon book improves their news ethic ... like don't hold your breath. Here we go again on historical revisionism over the failed Bondi heavy rail scam. We were Bondi Ward councillor at the time. And chair of the Waverley Council Environment Committee. The proposal was a corporate scam. Caton had a marginal role that I don't even recall. Bill Leak was higher on the agenda as an opponent, raffling artwork for the cause. Lee Rhiannon, now MP was a central opponent given the banker scam behind it. As was Mayor Paul Pearce, in effect over the siting in Bondi Park, and failure to build a mid way station as promised. The wheels fell of the dog of a proposal. Greiner quote reveals failure of the character test again? Clennell's feature on Nick Greiner was amusing in yesterday's Corporate Cartoon Book aka Sydney Daily Telegraph. Once one wades past the social trash pages. Amusing for the self censorship and spin of both writer and subject, or editor - take your pick. There is Greiner with the enormous howler, and non sequitur, claiming a bribe via a fat EPA directorship job in 1991 to get an MP to quit in a hung parliament, is the same as Robert Oakshot MP today taking a reasoned position in harness as an MP for or against supporting the current federal ALP government. Greiner by that quoted rhetoric shows he continues to fail the character test, just like his promotion of corporate car industry, smoking, and forest destruction in his private career for decades. Greiner asks gormlessly or perhaps arrogantly what is the difference? A world of difference. In one there is no bribe. In one the MP is not being pushed out of parliament to cancel their vote. One is not corrupt. The other is. Sad to see Clennell omit Greiner's history in British American Tobacco given the political donations issue that is relevant today. Sad also to see Clennell, ex SMH, omit several other close fought marginal seats in the 1995 election by dwelling only on Badgery's Creek, and omit Metherell's defection to the cross benches over the protection of wilderness areas. Given Greiner's corporate history with Big River Timbers Pty Ltd.
Amusing and ironic to see Premier O'Farrell effectively call Greiner a political dunce, as if to distract from the real issue of character. Because Greiner is not stupid, which leaves only one other explanation as per the headline. Greiner's career f*cking the lungs of the world? Nick Greiner posing on the board of Bradken Pty Ltd along with a colleague Gregory Laurie still on the board of Big River Timbers Pty Ltd. Refer the link on the pic. Ironic headline front of the Corporate Cartoon Book aka Sydney Daily Telegraph today? Greiner hounded out of politics for a slick attempted deal to entice indy MP Metherell off the cross benchers in 1991-2 to be head of the EPA. Blocked by senior public servant and upright Neil Shepherd who wouldn't step aside. Minister Tim Moore and Premier Greiner both investigated by ICAC and reversed on appeal, but the damage done. Not well known that Metherell went indy, after difficult tenure as Education Minister, to block Greiner destroying NSW wilderness areas under the then bipartisan 1987 Wilderness Act. The damage done too in Greiner's career of wrecking the world's lungs and atmosphere as his party refused to have him back in a sensitively balanced parliament. Associated way back with Big River Timbers in the old growth forest destruction game. Another reason Metherell rejected him. Note the professional association still to this day in the picture above. Deeply involved in escalating the burning of coal via higher exports from Port of Newcastle. Mr Fixit? Only if you don't want to breathe, or don't give a fig about the atmosphere, in a NSW Govt that rejects a carbon tax. 'Manager' Ian Barnes & co implicated in 20 years of past illegal logging of south coast koala, owl, quoll tourism resource? Picture: 1994 cartoon representation of regional forester Ian Barnes undertaking illegal logging at Croobyar State Forest, by public servant and covert activist Geof T.
LOGGING has started in a forest containing the only known colony of koalas on the far south coast, despite warnings the work could threaten the marsupials. Forests NSW began harvesting timber for woodchipping and high-quality logs in the Mumbulla State Forest near Bega. Work is expected to continue for six months. Conservationists, with the Nature Conservation Council of NSW, the Wilderness Society and the Australian Koala Foundation, are setting up a vigil at the site this morning in an effort to stop the logging. Locals said just last week they had found koala tracks on roads close to the work area. But Forests NSW said koalas had been found in the east of the forest, not in the logging area, which is further west. The fashion designer Prue Acton, who has battled to protect the koalas and who recently discovered a bugging device, which she believes is linked to her campaigning, on her telephone at her home near Bega, said the work could destroy the patch of habitat left in the area. ''This decision by Premier Keneally to log these critical regional koala habitats comes down to a few jobs in a dying industry and faulty regional forests agreements which fail wildlife, climate and water,'' Ms Acton said. The Greens MP Lee Rhiannon called the logging ''environmental vandalism'' and said it showed that the environment was the ''poor cousin'' to logging in NSW. ''For too long now the NSW government has refused to end the logging of south-east native forests,'' Ms Rhiannon said. Greens MP and spokesperson for South East NSW Lee Rhiannon and Chipstop spokesperson Harriett Swift have called on the NSW government to honour the agreed temporary halt to logging in the Mumbulla Forest by removing all their forestry equipment from the site and returning it to the local depot. Speaking from the site of the blockade to Ms Swift stated, "Protesters this morning have successfully blockaded the entrances to the planned logging area in Mumbulla Forest that would threaten koala habitat. "A large turn out of locals are staging this peaceful protest as we have no confidence that the NSW government is committed to protecting the habitat of the last known population of koalas on the NSW south coast and abiding by the agreed halt on logging. "There are a group of loggers waiting here to start work. "Forests NSW still have the prohibited zone declaration in place for logging this area, the roads are closed as is usual in any logging operation and the mechanical harvesters and bulldozers are all here, along with the logging trucks and the logging crews. "So why would we believe the word of Minister Ian Macdonald that logging is on hold. Ms Rhiannon said, "Premier Kristina Keneally should insist on a moratorium on logging and that has to mean all equipment is removed from the proposed logging area and returned to the local depot. "Mr Macdonald's past performance as primary industries minister suggests that he will be looking for ways to continue logging. I am not surprised that the locals are continuing their protests and that they don't believe the word of this minister. "Leaving the equipment in the forest undermines the studies to determine the presence of koalas in the proposed logging area. Evidence of koalas is not going to be found amidst all this disruption. "Ms Keneally has a chance to take a stand for the environment. "Surely she does not want the voters to remember her as the Premier who trashed the habitat of koalas," Ms Rhiannon said. the Liberal Party Environment Minister Chris Hartcher and the NPWS ordered 3 circular areas of 1km radius each (or maybe 1km diameter? ) for protection from loggers. 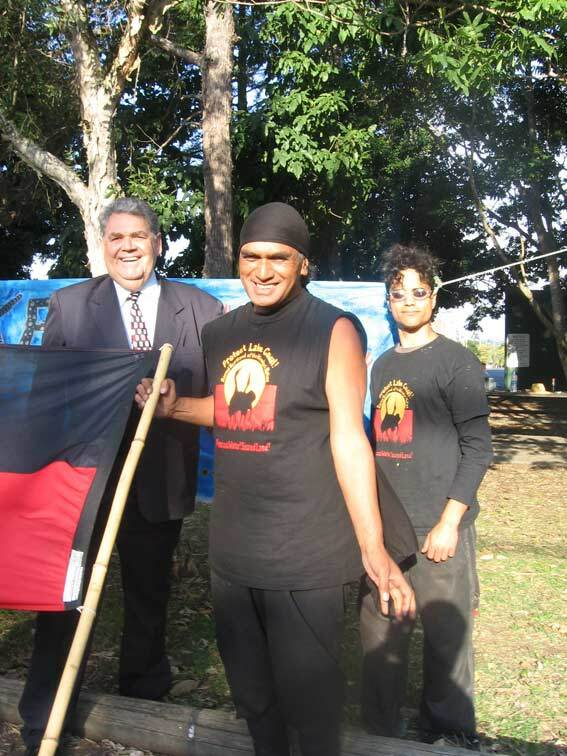 Picture: Winiata Puru, forest defender at Croobyar on the south coast in 1994, campaigner for Lake Cowal traditional owners (shown here), and guardian of the Aborignal Tent Embassy in Canberra in 2010. A very fit musically gifted 55 year old champion of environmental and social justice concerns. As per the email last, we recall another forest area called Croobyar SF back in 1994 north of Mumbulla, in the "Bateman's Bay Management Area" where illegal logging was being undertaken by the very same government forest 'manager' Ian Barnes for the NSW Govt under then Commissioner Hans Drielsma - now behind the Gunns pulp mill for Forestry Tasmania. Mumbulla and Yurammie mentioned above falls within the neighbouring Eden Management Area which at least had a quick and dirty Environmental Impact Statement as inadequate as it was. That EIS was overtaken in the early 1990ies by a Parliamentary Inquiry, private members bill sponsored by Clover Moore MP for Bligh, then coarse grade somewhat political "CRA" negotiations over the same Eden MA after the Carr election in 1995. CRA stands for 'Comprehensive Representative Adequate' being a euphemistic phrase out of the Keating Govt National Forest Policy. These CRAs inevitably led to political 'Regional Forest Agreements' (RFA): Coarse and often dirty decisions as made clear by the article in the SMH today on water and koala resource at risk of being trashed by private logging interests at direction of the redneck State Forest agency. Carr boasted hundreds of new national parks but internal RACAC maps show modest purple areas of new park, next to long time existing national parks in dark green, and even bigger logging area in light green to reveal the truth behind the spin: Refer internal nsw govt RACAC maps posted here. We've been traversing the Croobyar Forest winning blockade of 1994 and realise there was never any EIS done for the whole Bateman's Bay Forest MA for 20 years, much of that under Ian Barnes control for the NSW Govt logging agency. Thus most logging was illegal for two decades. Croobyar forest in 1994 is quite comparable to the Redgum forest controvery of today 2009-10 with no EIS despite the 1979 Environmental Planning and Assessment Act requirement, forcing recent litigation and political decision making. In the case of the BB MA in the 90ies Carr resolved the illegality with a political CRA negotiation to forestall legal action and then passed forest legislation in the late 90ies gazumping any legal need for an EIS: Causing a major split in the green movement against any political deal given continued logging threat to the tourism economy, lack of an EIS ever done, and minimal community loyalty to the Eden chipper geographically much further south. Picture: Ian Barnes and NSW govt forest agency avoided any EIS for logging public forests in Batemans Bay forests for 20 years despite requirement of the 1979 Environmental Planning legislation. (In the Redgum situation no intervening forest legislation has ever been passed to gazump need for an EIS under the 1979 Act, hence Premier Rees/Sartor/Keneally have to intervene to resolve the long running illegality there). This lack of an EIS was a major bone of contention in the 1990ies: The Wilderness Society thought about a legal challenge given there was an EIS for Eden and Corkill legal victory in late 1991 re no EIS done for Chaelundi in the NE. Conclusion: Barnes is thoroughly unreliable on forest fauna issues given he was willing to operate outside the law for many years up to the late 90ies, in BB MA: Not surprising given he served originally under Commissioner Hans Drielsma who now runs Tasmania Forest Commission promoting the ultra controversial Gunns pulp mill. Dreilsma was effectively run out of NSW by about 1996. ABC friendly Noel Plumb indy candidate for Liberal seat of Ryde? We noticed an unusually long abc talkback earlier this week by "Noel" from "Ryde" on the ABC Deborah Cameron Morning show. He waxed lyrical about why ratepayers should pay their fair share for council services. Fair enough. And he went on, and on, and on. Not so much talkback as open line, take as much air as you like. It was average sort of radio, neither good nor bad, but why so long? This was the same Noel who waxed lyrical a week or so earlier about being a sailor on Sydney Harbour for 30 years in relation to concerns over the Barangaroo - Keating /Lendlease - monster. Fair enough only it went on and on. Very generous I thought. And we don't remember him sailing (?). Now Noel has an interesting provenance in NSW politics. As we understand he helped deliver preferences to ALP Deputy Premier John Watkins in a usually Liberal area for the seat of Ryde until he retired earlier this year. This is in the same area as Maxine McKew, a well known former ABC presenter, in the federal seat of Bennelong. As far as we know Noel didn't run in the seat for the Watkins related byelection and it is now held by Victor Dominello (Lib). Noel previously ran for the Australian Democrats, has been a staffer for Ian Cohen MP of the Greens and we are not sure who he is affiliated with now. He leads a small but active Sydney affinity group called Chipbusters relating to woodchipping in south east NSW also this last 6 months or so, especially the koala habitat there. We remain concerned that name is too similar to ChipStop organised by Harriet Swift based in Bega already of 10 years standing but she doesn't seem to mind. Of significance in the upcoming election is that as we understand it Noel was part of a narrow local lobby, including Dr Judy Messer former chair of the Nature Conservation Council, and contrary to public transport activists across Sydney, that successfully prevented a rail bridge over Lane Cove River at Epping which arguably resulted in major delays and perhaps $1B in extra cost for the new Chatswood to Epping line. That blowout arguably prevented the line ever reaching Parramatta as well as a saga of noise and gradient problems. Watkins can be very deferential to Plumb as we have observed, and we notice the former Deputy Premier was on abc segment Partyliners a week or so back complimenting Premier KKK, from his perch as CEO of Alzhiemers Australia. A silent machine to quote fixer Eric Roozendaal MP (ALP). Subject: Community media re Noel Plumb as state election candidate in Ryde? 1. Are you intending to run as a candidate in the seat of Ryde now held by Liberal Victor Dominello? 2. Will you run as an independent, or Greens or Australian Democrats, or even pre-selection for the ALP given John Watkins has retired? 3. If as an independent, or minor party, what chances do you think you will have in influencing the final outcome in Ryde, and the state if it's a hung parliament scenario, with your preferences, including any relevant statistics from past elections? (a) closure of the Eden Chipmill as promised by Bob Carr in the 1995 election? (b) Similarly rejection of power generation using native forest feedstock? (c) Protection of koala habitat on the NSW South Coast? (d) Protection of all NSW forest identified for comprehensive, adequate, representative reserve system given barely 10% of Australia has forest land cover with rare quolls, gliders, owls, possums, frogs and other wildlife live in these landscapes? (e) A ban outright of logging of any wet schlerophyll forest types as natural bushfire fuel management, which logging converts to dusty dry flammable regrowth? Look forward to your response in due course. Sadly we hear Mark has died of leukemia after a long illness. We only knew him as a hearty and hale forest campaigner working inside the system in the 1990ies, as much as practical, as indicated by extracts in this 1996 NSW Govt newsletter referring to Mark. But not pictured unfortunately. This writer however can be seen top right hand corner of one image in the Govt PR glossy: Sceptical, overlooking as usual with caffeine in hand. Mark Blecher as respected local teacher and as leader and public face of South East Forest Alliance in the region, in Bega was the NGO rock upon which the Carr Govt relied for it's conservation forest policy having regional credibility for southern half of NSW from about 1994 all the way to 2000 or so. In the north Dailan Pugh/John Corkill played that same real politik role via leadership of NEFA. In the city Jeff Angel was the SEFA authority figure for the Carr conservation forest policy, (first as junior co director to Milo Dunphy then sole director of TEC) but only because Mark Blecher was in alliance at the regional level for SEFA providing democratic credibility to small TEC, Jeff leveraging off that utilising TEC go between Fiona McCrossin (previous housemate up here) sister of more famous Julie. This suited Carr to offset the much bigger and more hard line Wilderness Society forest reform policy. In this sense Mark played a critical role in NSW forest politics. On a personal level he was always very dignified and intelligent and indeed very diplomatic. I would hazard a guess that he was appalled as Dailan Pugh and others were subsequently at the way the high hopes of the Carr Govt tended to unravel by say 1998 -1999 when the luke warm promise to Ian Cohen, later MP, in the lead up to the 1995 election to close the Eden chipmill failed to materialise. One can speculate that failure to privatise the multi billion energy sector in 1997 had a significant role in Carr's settings resulting in barely half the forest recommended for protection being saved, as borne out by official RACAC maps of the time since published by the writer. Carr talks often of the 300 parks he created but not the broader reality. Rather the industry achieved 20 year logging RFA resource security - even in koala habitat - and the new as distinct from existing National Parks are significantly smaller than the logging areas - all on public heritage land. One can see a refusal to be duped again in the current Redgum compromise and controversy. The privatisation of energy agenda 1997, again 2007, failed not least from a broad democratic view about corrupt corporations in the USA like Enron. In that sense everything is connnected. Mark loved forests. And harmony in his local community. I can't help thinking his illness and death is a metaphor for irreconciliable differences of the public and the government over the Eden chipmill May he rest in peace. God bless him - his part in our struggle is over. Man on Horse in the Snowies actually walked, was black and not in the mountains ...? Every few years we have a public debate about preservation of the Snowy Mountain Parks due to wild horse populations. Just like feral camels damage the landscape. We have been involved in this debate since the early 1990ies when 3 state MPs Smith, Schultz and Cochrane made it their mission to attack the NSW Wilderness Act 1987. The Act passed with bipartisan support but these rednecks believed in logging of public lands, high impact recreation and opposed anything proposed by the green movement. Our job was state organiser with the Wilderness Society at the time. We caught via excellent local detective work of regional environmentalists Cochrane & Co misleading the Fahey Coalition Cabinet with a diagram showing townships and air strips in so called proposed sterilised wilderness areas. Not that we were in Cabinet, but sharp eyed Tumut residents took a photo of a diagram on local tv news and noted the false map boundaries and briefed us on the alarmist sham. We had a nick name for the land use sleaze "Horse Rorts" (a play on words of the infamous federal Minister Ros Kelly "Sports Rorts" scandal). Cochrane MP in particular has been associated with horse riding commercial tourism interests in Kosciuszko National Park ever since. We have kept the above cartoon and letter that ran in the News Ltd paper The Australian from15 years ago because it tells another side of the colonial story, when you remove the white arm band view of history. That is that most horseman in the bush were Aboriginal blokes on low or no wages, and they weren't in the moutains but the plains. Second that "in the ranges horses had a very limited role" and the pioneers mostly walked. This puts a whole different view on the legendary fiction of the poem called The Man From Snowy River. Horses, it appears, were never an integral part of the Australian Mountain heritage, they are a modern popular construct of film and literature not real history. Carr's guilty conscience on east coast forests in redgum plea? Picture: Contrary to NSW govt PR logging intensity as high as ever 2001 Upper Deua wilderness. Former premier Bob Carr was forced out in 2005 as his polling crashed, allowed by the ALP machine to limp along in the job until his 10th anniversary before resigning. 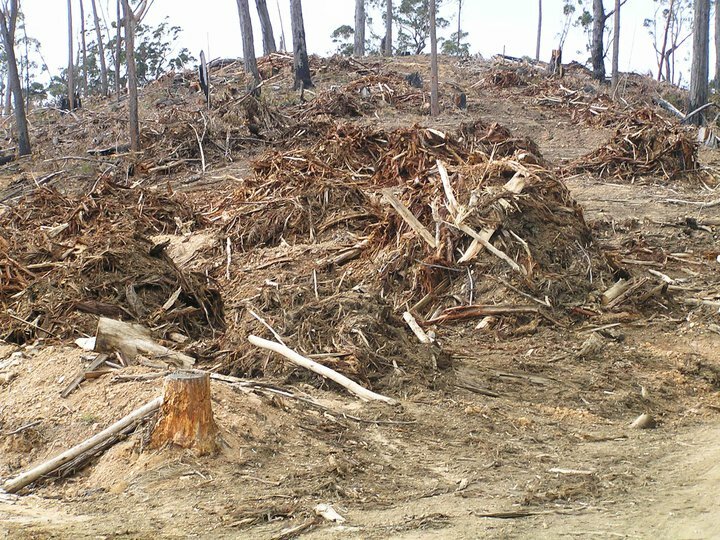 Not many people have really analysed the net environmental consequence of Carr's main boast of forest protection of NSW eastern division forests. The story is not nearly as good as Carr would have people believe. Carr is known as a thespian so a reality check is again in order. Especially because Carr has leapt into PR mode in the last few days via Get Up organisation urging protection of redgum forests in south west NSW. A good message from a damaged messenger. And if he is acting out of a guilty conscience, at least it's in evidence unlike ex PM Paul Keating who failed Australia's forests dismally with his initiative of so called Regional Forest Agreements. Yes history of the 90ies is stale 10 years old, but the current ALP is a product of it's past with same habits. On redgums Carr is surely posturing for the next state election. And he might be well motivated. And he might be riddled with guilt! Who knows. The message is right, but the messenger is damaged goods. I remember in harness for TWS in 1994 pre election he promised to save wilderness areas. But his policy actually said 365K ha out of 713K ha identified under the legislative process Wilderness Act 1987 passed with bipartisan support. Alan Hansen who worked for Opposition Env Minister Pam Allan rang me personally to complain about exposing this detail in the official newsletter of TWS. They seemed to think the green movement were ALP serfs. "To hide this reality Carr went the big lie PR option - ‘biggest forest decision in the world’. I still remember The Wilderness Society putting out a list of bigger conservation decisions worldwide - about 20 of them - in a brutal lampooning of Carr’s arrogance. With environmental friends like Carr who needs enemies." that outstrip or equal Bob Carr's "world record" fantasy. Who knows, maybe Carr is trying to make amends with the Redgums to do the full job? Miracle if it's true. We saved the South East forests, the North coast icons and the Pilliga. These were all generous conservation outcomes, and no unemployment resulted. Im sorry but what the? hes such a liar. still good on him for doin the get up thing & your right sean - great exposure. -still, in case anyone has forgotten whose signature is on the RFAs, Bobs got a lot to answer for. This is fantastic. Can we get the same exposure for our koalas? From the air they are bands of green that emerge from the Great Dividing Range and run along the banks of our major rivers as they snake west. On ground they are stately silhouettes, mighty arms akimbo, hefty trunks streaked red on white: statuesque, unmoving, some hundreds of years old but with the look of eternity. The river red gums are the guardians of inland Australia. Enter these forests. Set off a mob of kangaroos. Then hear the silence settle. Look around and be filled with the wonder of being in ancient Australia. Log these? Log them for another 5 years until the old ones are all gone and we are left only with straggly regrowth? Log them when 80 per cent of the landscape along the Murray has already been cleared? When on some stretches 75 per cent of the trees are already dead or dying or stressed because of drought and climate change? Log them for firewood and railway sleepers and fence posts? Many parts of our country are in flood, but the Murray-Darling, food bowl of our nation, is still cracked and dry. The River Red Gums that stand guard on its banks are a gift to future generations. They are of national significance, and it falls to all of us to protect them. The most reliable estimate is that there are only 136 jobs in red gum logging on public lands across NSW. Timber jobs are 0.2 per cent of employment in the region. All can be accommodated in new national parks. How can I be so certain? First, because Victoria has just done it. As of June 30 last year, logging stopped forever in 91,000 hectares of red gum wetlands. The outcome is jobs positive because there are 30 new park ranger jobs in four new parks, 10 jobs in forest management and 24 jobs in the tourism sector. Second, because NSW offers loads of experience in world-significant nature conservation made possible through industry restructuring without job losses. We have had 30 years of these arguments. Each has ended with decisive conservation victories, and the outcomes have been endorsed at state elections. In my experience - and I was environment minister in the Wran government between 1984 and 1988 - the case made by conservationists starts by looking over-reaching. But it always ends up being vindicated. In their bones country and city people alike know that as the continent's population climbs (to more than 40 million by mid-century, according to the latest estimates) we will count precious every hectare of national park this generation has declared. Bob Carr was the longest continuously serving NSW premier. This message was sent through GetUp.org.au and your personal details have not been shared with Mr. Carr or anyone else.